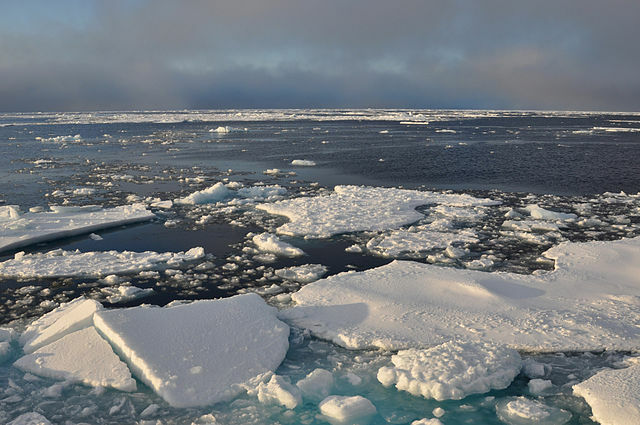 Arctic Sea Ice Dips Below Ominous Milestone | "Global Possibilities"
Walt Meier at NSIDC tells me the melt is accelerating, notably in the Bering Sea, where higher than normal winter ice hung around two to four weeks longer than average. But it’s thawing fast now. 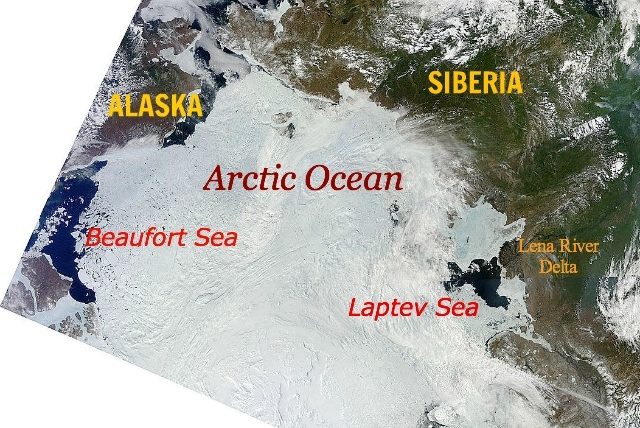 As you can see from the satellite mosaic of the Arctic for today, 14 June (above), the rapidly melting Laptev Sea lies at the downstream end of the mighty Lena River in Siberia. 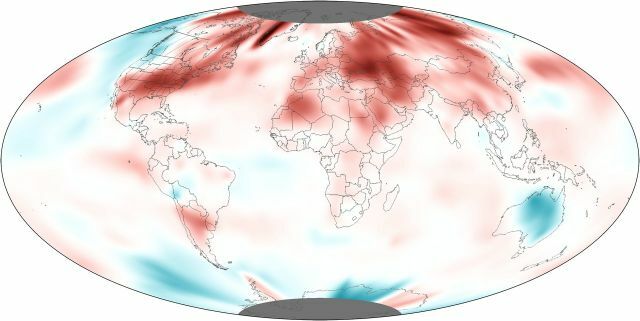 The Beaufort Sea lies at the downstream end of Canada’s mightiest river, the MacKenzie River (delta not visible)—where May temperatures rose well above the 20th-century average (see last image, below). 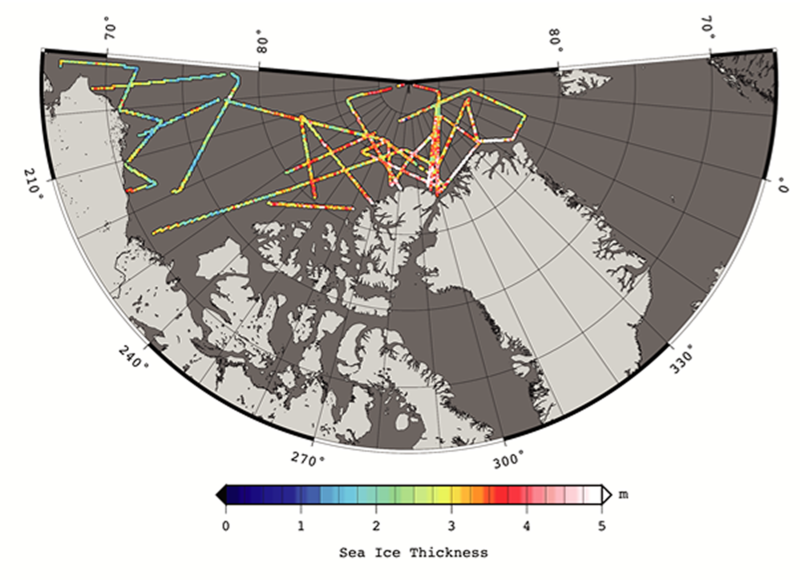 Arctic sea ice thickness derived from the 2012 Operation IceBridge between 14 March and 02 April 2012: S. Farrell and N. Kurtz, NASA Goddard Space Flight Center.Ice thickness data (above) show the Beaufort’s sea ice to be thin—3 to 6 feet (1 to 2 meters). That’s the signature of first-year ice. Which means it will be prone to melting completely this summer. Sorry, polar bears, bearded seals, ringed seals, and walruses. 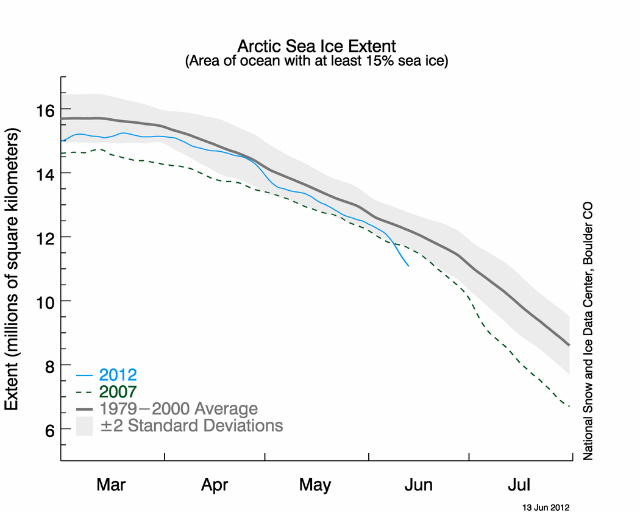 Overlay the current sea ice melt map onto this map of May 2012 temperature anomalies. You can see how warm it was in the Beaufort Sea (upper left). The Laptev Sea / Lena River region is not visible in this view.